As the world is moving in 21st century and in the next phase of urbanisation and development, the problem of communicable as well as non-communicable diseases (NCDs) is also increasing day by day. NCDs are a group of gradually progressing, largely preventable diseases of long duration that are responsible for various morbidities and mortality. NCDs like cardiovascular diseases, cancers, diabetes and chronic respiratory diseases are currently the leading causes of death and disability globally. In India, NCDs were responsible for 53 per cent of deaths and 44 percent of disability. They cause an estimated 8.5 million deaths each year in South East Asia region, with half of these deaths being premature and among productive citizens aged 30-70 years. In India, nearly 38% of the population stays in urban areas whose lifestyle and dietary changes are side effects of being in urban areas. Hypertension, diabetes, obesity, cardiovascular diseases constitutes most of the NCDs who share common risk factors either modifiable like physical activity, waist circumference or non-modifiable such as increasing age or family history. The diagnosis, treatment and management of disease as well as its complications are life threatening and expensive but at the same time, are preventable if taken into account at the right time. The premature deaths and disability can be decreased through implementation of cost effective, affordable and proven health policies that enable and promote healthier life style. To study the magnitude of shared risk factors for Non-com-municable diseases in adults of an urban resettlement col-ony of Delhi. The present community based cross sectional study was conducted in an urban resettlement colony of East Delhi, Kalyanpuri to assess the common risk factors of Non-communicable diseases in an adult population (>30years) during January 2014 to December 2014. Both government and private health care agencies cater to the health care needs of the residents. Using the prevalence of obesity in the study done in north with same settings, the sample size size came was 566. Kalyanpuri, an urban resettlement colony had total llblocks numbering 11 to 21. Out of these, 5 blocks i.e. block 11, 12, 16, 18, 20 were selected using simple random sampling. Proportionate numbers of houses were identified by Population proportional to size sampling in each block. Permanent residents of Kalyanpuri (residing >lyear) were included and 586 subjects gave consent to participate in the study. Six subjects were excluded as they were pregnant. Thereby, the final sample size was 580. Socio-demographic characteristics: Age, gender, marital status, education, occupation, religion, family type and total family income. Socio economic status was calculated by modified Kuppuswamyscale. Physical activity was measured using GPAQ (Global Physical Activity Questionnaire ) by WHO. Dietary assessment was done by collecting information regarding intake of fruits and vegetables, dietary fibre, oil intake, salt intake, junk food items. Addiction habits regarding smoking, alcohol, substance use were enquired. Stress was assessed using General Health Questionnaire 12 (GHQ12). Data analysis: Data was entered and analyzed in SPSS version 12. Continuous data was expressed as mean, median, standard deviation, and 95% CI was used. The categorical data was expressed as percentage/proportions and where ever applicable χ2 and analysis of variance (ANOVA) after check of normality by Kolmogorov Smirnov were used. Multivariable logistic regression models were constructed relating the significant factors with socio demographic factors. A ρ value of less than 0.05 was taken as statistically significant. Approval was taken from Institutional (Lady Hardinge Medical College ) Ethical Committee. A written consent was taken from each study subject. Those who were illiterate, thumb impressions were taken in front of a witness. All information collected was kept confidential. All the study subjects who were found with risk factors were referred to a secondary level hospital/Tertiary level hospital for their further workup. The present study was conducted in Kalyanpuri, an urban resettlement colony of Delhi. A total of 580 study subjects were recruited. Figure shows the age group of the study subjects. The overall mean age was 43.38 (±11.26) years with a range 30-75 years. The mean age was 44.98 (±10.89) years and 42.01(±11.40) years for men and women respectively. Out of the total 580 subjects 53.96% were women and 46.03% were men. 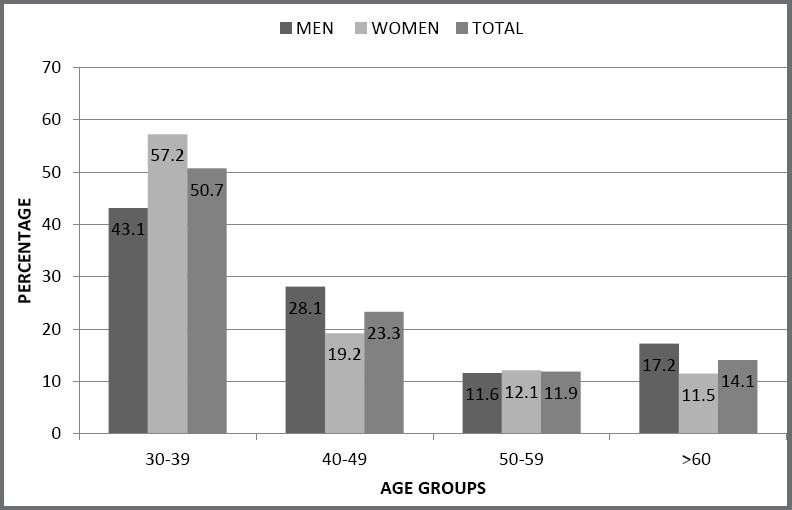 Nearly three -fourths of the study subjects belonged to 30-49 age group as seen in [Figure 1]. 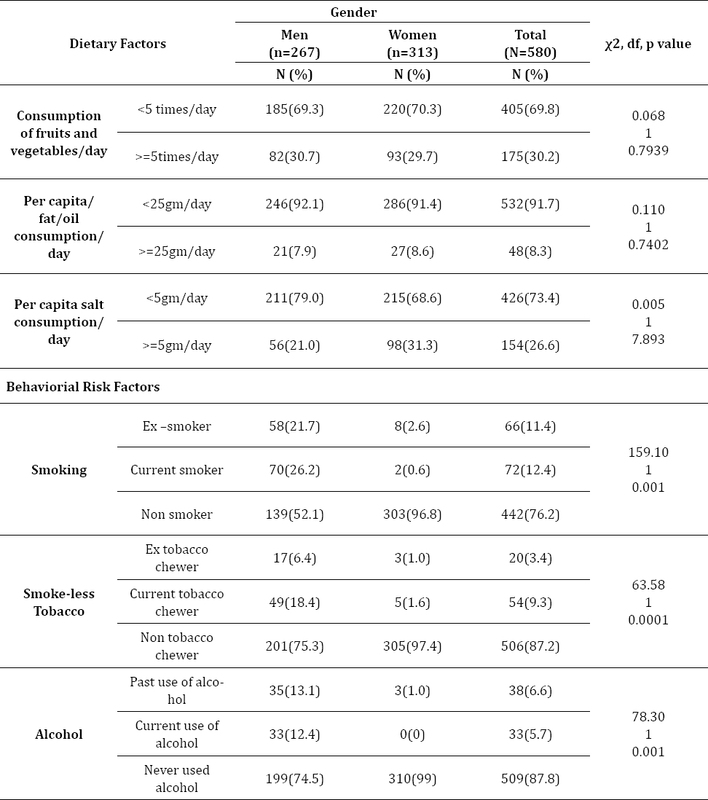 [Table 1] represents the dietary risk factors where majority (69.8%) of the study subjects were taking inadequate fruits and vegetables (<5 times/day) which was almost similar for both men and women. Majority (91.7%) of the study subjects were taking <25 gm /day of saturated fats/oils which was almost similar across gender. Nearly 27% of the subjects were taking >5 gm of salt per day. [Table 2] represents the distribution according to physical activity and waist circumference. Majority of the study subjects were moderate workers (62.9%) and about 31.2% of the study subjects were sedentary workers and the proportion was similar among both the gender. Only few 34 (5.9%) were heavy workers, men (7.1%) slightly more than women (4.8%). The overall mean waist circumference was 85.48cm (±7.680) with a range of 67-153cm. It was 84.89 cm (±6.47) and 85.98 cm (±8.55) for men and women respectively. More than half of the women 178 (56.9%) had waist circumference more than 88 cm. Majority of the men (83.5%) had waist circumference within normal limits. [Table 1] shows the consumption of tobacco, smoking and alcohol. 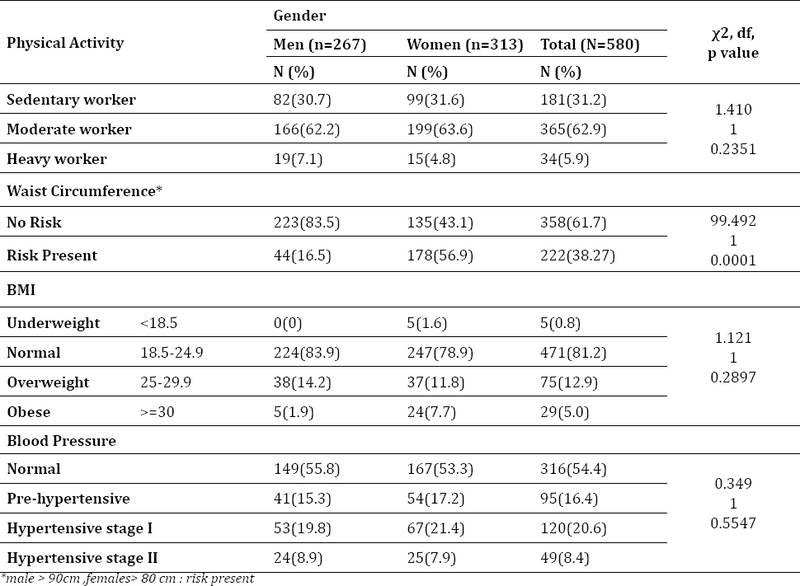 Majority 303(96.81%) women were non-smokers but one in four men were smokers.18.4 % of the men were current tobacco chewers as compared to 1.6% of women. Only 33 (12.4%) men were currently consuming alcohol whereas none of the women were currently taking alcohol. 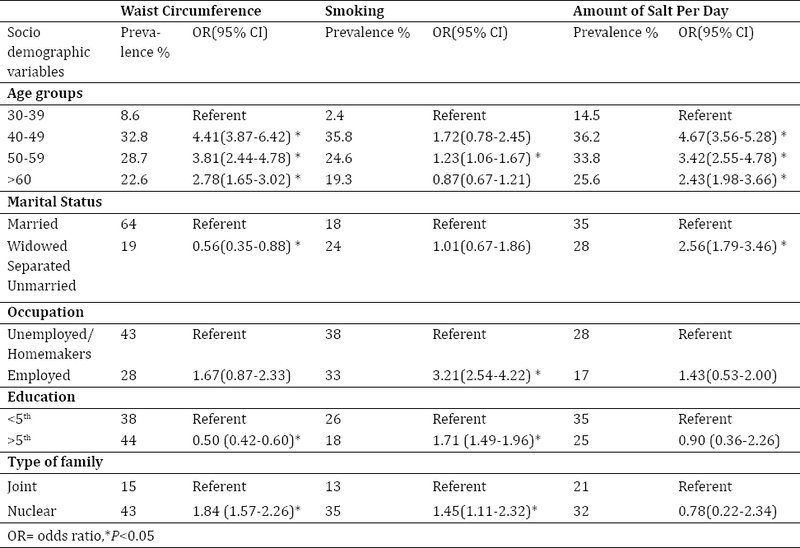 Chi-square test showed the significant association between per capita salt consumption/day, behavioural risk factors and waist circumference. Table 2: Distribution of study subjects according to physical activity, BMI and Blood pressure. 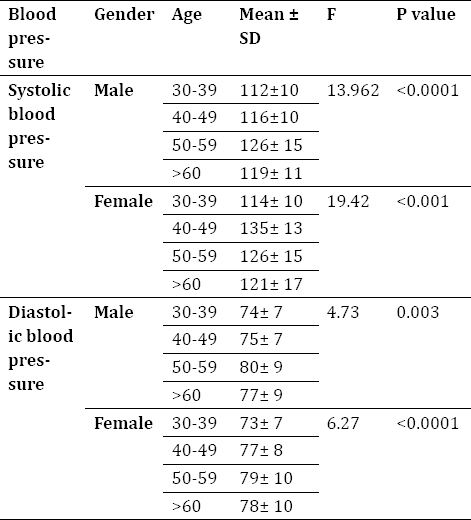 Comparison of systolic and diastolic BP with ANOVA among different age groups is shown in [Table 3]. The mean systolic and diastolic BP increased with age in both sexes. At 30-39 and 50-59 age group mean systolic BP was significantly higher in male (P < 0.001 in both age group), but at >60 years age group, it was only significant in females. Mean di-astolic BP at 30-39 age group in female significantly higher than male (P < 0.001), but there was no significant differ-ence between both gender at other age groups. Results of multiple logistic regression analyses are shown in [Table 4]. Increasing age, education and marital status were found to be significant socio demographic factors for increased prevalence of risk factors for NCDs. The common risk factors for Non-Communicable Diseases are tobacco use, unhealthy diet, physical inactivity and excess adiposity. This study showed high prevalence of these risk factors in the community. Majority (93.7 %) of the study subjects did not report any family history of diabetes and hypertension. These observations are similar to that conducted by Anand et al, Sadeghi et al and Gupta et al.,, Few Indian studies conducted by Revathi et al and Mohan et al in Kerala and Tamil Nadu reported a higher prevalence of family history of diabetes., This may be due to the fact that the study subjects lacked awareness regarding family history of diabetes. Only 7.2% of the study population, including 8.9% of women and 5.2% of men, reported to be under stress close to the findings of Laskar et al as assessed with General Health Questionnaire-12. Although majority of women in our study were homemakers they were engaged in moderate physical activity doing all the household chores themselves. Overall the level of physical activity was found to be high in our study population. This is a very encouraging finding in our study and must be promoted at all levels. Alcohol consumption was seen in 21% of men while in other studies, 32% and 28% of men and women were consuming alcohol respectively in studies by Deepa et al & Gupta et al., This might be due to social stigma leading to under-reporting by the study subjects. A concern in our study sample was the proportion of participants with sub optimal blood pressure. Nearly 44.2% of the participants had high blood pressure (>120/80 mmHg). About 15.3% and 28.7% of the participants had pre-hypertension and hypertension respectively that is increasing with advancing age. The findings of our study are concordant to those reported by Bhalerao. However Ketkar conducted a study in workplace and reported higher prevalence of pre-hypertensives (61.5%). More than half (54.4%) of the study subjects had normal blood pressure which was similar across gender. Increasing age, education and marital status were found to be significant socio demographic factors for increased prevalence of risk factors for diabetes. In this community based study we have found a high prevalence of risk factors for NCDs which warrants for immediate concerted action. Promotion of lifestyle change to address these risk factors as weight reduction, increased physical activity and healthy eating should be encouraged. Population based screening for common risk factors for all non-communicable diseases needs to be started in this community with regular follow up and action. In view of the high burden of risk factors in this community, it is recommended to start an NCD clinic at Urban health centre Kalyanpuri so that screening of all adults can be done along with health education of the community. Mortality and burden of disease estimates for WHO Member States in 2004. Geneva: World Health Organization; 2010. World Health Organization. WHO STEPS surveillance manual:The WHO STEPwise approach to chronic disease risk factorsurveillance. Geneva: World Health Organization; 2005. Ketkar AR, Veluswamy SK, Prabhu N, Maiya AG. Screening for non communicable disease risk factors at a workplace in India: A physiotherapy initiative in a healthcare setting. Physiotherapy journal, 2015; 33(1): 3-9. Revathi R, Logaraj M, John KR, Sathiyothan K. A community based cross-sectional study on factors associated with diabetes mellitus in an urban area in Tamil Nadu. The Health Agenda.2014; 2(3): 1-4. Bhagyalaxmi A, Atul T, and Jain S. Prevalence of Risk Factors of Non-communicable Diseases in a District of Gujarat. India.J Health PopulNutr. 2013; 31(1): 78-85. Deepa M, Pradeepa R, Mohan V. Noncommunicable Diseases Risk Factor Surveillance: Experience and Challenge from India. Indian J Community Med. 2011; 36(Suppl1): S50-6. Bhalerao SD, Somannavar M, Verneka S, Ravishanka R, Goudar SS. Risk factors for type 2 diabetes mellitus in rural population of north Karnataka: a community-based cross-sectional study. Internatioanl Journal Of Pharma Med And Biological Science.2014; 3(1):1-14. Shirani S, Poormoghadas M, KelishadiR, Baghaii A, Sarraf-Zadegan N: Diabetes and associated cardiovascularrisk factors in Iran: the Isfahan Healthy Heart Programme. Anand K, Shah B, Gupta V, Khaparde K, Pau E, Menon GR et al. Risk factors for non-communicable disease in urban Haryana: a study using the STEPS approach. Indian Heart J. 2008; 60(1): 9-18. Laskar A, Sharma N, Bhagat N. Lifestyle Disease Risk Factors in a North Indian Community in Delhi. Indian J Community Med 2010; 35(3):54-9. 8. Sadeghi M, Roohafza H, Ann Acad Med Singapore 2007, 36(3):175- 180. 9. Sadeghi M, Roohafza HR, Kelishadi R: Blood pressure and associated cardiovascular risk factors in Iran: Isfahan Healthy Heart Programme. Med J Malaysia 2004, 59(4):460-467. Gupta R, Rastogi P, Sarna M, Gupta VP, Sharma SK, Kothari K. Body-mass index, waist-size, waist-hip ratio and cardiovascular risk factors in urban subjects. J Assoc Physicians India 2007; 55 : 621-7. Galal O: Nutrition-related health patterns in the Middle East. Asia Pac J ClinNutr2003, 12(3):337-343. Mohan V, Deepa M, Farooq S, Prabhakaran D, Reddy KS. Surveillance for risk factors of cardiovascular disease among an industrial population in southern India. Natl Med J India 2008; 21 : 8-13. Prabhakaran D, Shah P, Chaturvedi V, Ramakrishnan L, Manhapra A, Reddy KS. Cardiovascular risk factor prevalence among men in a large industry of northern India. Natl Med JIndia 2005; 18 : 59-65. Report of the ICMR - WHO study on assessment of burdenof non-communicable diseases. New Delhi: Indian Council of Medical Research; 2006. Ravikumar P, Bhansali A, Ravikiran M, Bhansali S, Walia R, Shanmugasundar G, Prevalence and risk factors of diabetes in a community-based study in North India: The Chandigarh Urban Diabetes Study (CUDS). Diabetes & Metabolism.2011; 37: 216-21. Mishra A, Pandey RM, Devi JR, R Sharma, Vikram NK and Khanna N. High prevalence of diabetes, obesity and dyslipidaemia in urban slum population in northern India. International Journal of Obesity and Related Metabolic Disorders. Journal of the International Association for the Study of Obesity 2001, 25(11):1722-1729. Sugathan TN, Soman CR, Sankaranarayanan K. Behavioural risk factors for non-communicable diseases among adults in Kerala, India. Indian J Med Res 2008; 127 : 555-63. Raghavendra AH, Chabra P, Sharma AK, MadhuSV Prevalence of diabetes mellitus in an urbanized village of east delhi.. National Journal Of Community Medicine.volume7, issue 4, apr 2016,302-306. F Asgari, H Aghajani, M Haghazali, H Heidarian. Non-Communicable Diseases Risk Factors Surveillance in Iran. Iranian J Publ Health 2009 (38):.119-122.